I try to feed my family a home cooked dinner five out of seven nights a week. Most weeks I make it to the grocery store or have enough protein in the freezer to whip something up! I like to treat myself to a meal delivery box every few weeks. Every women needs a week off meal prepping. is the top food delivery box I’ve tried! The quality of what was delivered was outstanding! Other delivery boxes always had something that was a little soggy or the quality is below what should be sent to a customer. Green Chef even prepped some of the produce for you, I absolutely love when I do not have to cut an onion! They label each bag with a number and color so it is easy to find what ingredients belong to the recipe you are cooking up that night. Green Chef gives you six options for the type of meal plan you want (Omnivore, Carnivore, Gluten Free, Vegan, Paleo, or Vegeterian). I specified my family wasn’t interested in seafood and received two delicious meals, pork kebabs and chicken katsu. The sides could have used a bit more flavor, but that is easy for me to add some more herbs to. 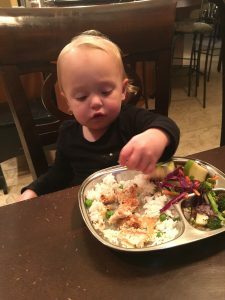 Their Carnivore Plan of two dinners for a family of four was perfect for my family! My husband offered to start one meal as we were not home from tennis. His idea of cooking is boiling water and throwing some pasta in! I thought this will be fantastic, all the ingredients are there and it should be pretty straight forward. After he called me three times asking where kitchen tools were I knew he wasn’t enjoying this cooking experience. In my husbands words, “I’m lost on an island!”. Although he struggled, the meal turned out delicious and we will continue to use Green Chef. Next time I will put out all the kitchen tools for my husband. Or maybe Green Chef could add pictures of what the tools look like. Any one else use call a strainer a sieve or a colander!? As you can see, my daughter enjoyed the meal! They have a special deal going on right now where you can get FOUR MEALS FREE with your first order! If you haven’t tried a meal delivery box yet, start with ! Never tried. Have to soon! Sounds great. Thanks Nicole!